The front side of this stele is carved with a principal image of Shakyamuni Buddha seated in a niche, while the reverse features a principal image of the Future Buddha, Maitreya, sitting cross-legged. The Shakyamuni Buddha sits beneath a flame-ornamented canopy and is flanked by a pair of Bodhisattvas: those most human of beings in the vast pantheon of Buddhist deities who, having achieved Buddhahood, elect to remain on earth out of compassion. The figure of Maitreya sits beneath an ornately decorated canopy and is also flanked by a pair of small Bodhisattva images. 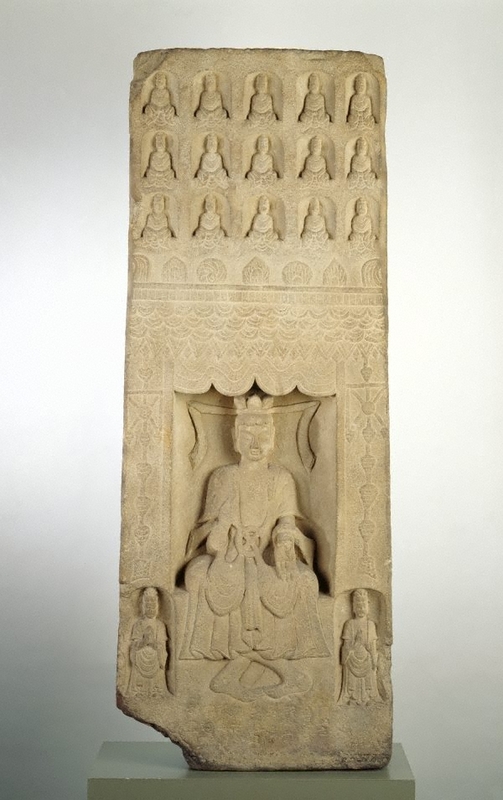 Above both the principal images the stele is carved with miniature Buddhas. A dedicatory inscription on the upper right bears the now partially damaged reign date, which reads: 'chang yuan nian...'. The absence of the first character precludes a precise date, but indicates either 512, 525 or 532. Further inscriptions on all sides of the stele give the names of donors who contributed to its construction as an act of Buddhist devotion. Art Gallery Handbook, 1999. pg.249. Yin Cao, The Connoisseur and the Philanthropist: 30 years of the Sternberg Collection , 'Chinese Art', pg. 12-23, Sydney, 31 Jan 2014, 17 (colour illus.). Edmund Capon, The Connoisseur and the Philanthropist: 30 years of the Sternberg Collection , 'The connoisseur and the philanthropist: the creation of a collection', pg. 5-10, Sydney, 31 Jan 2014, 9 (colour illus.). Edmund Capon, Look , 'The Arts of Asia', pg. 24, Heidelberg, Apr 1997, 24 (colour illus.). Joanna Capon, Art and Australia (Vol. 41, No. 4) , 'Goldie Sternberg. Benefactor', pg. 618-620, Sydney, Jun 2004-Aug 2004, 618, 619 (colour illus. ), 620. Bruce James, Art Gallery of New South Wales handbook , 'Asian Collection: East Asia', pg. 246-287, Sydney, 1999, 248 (colour illus.). Jackie Menzies, TAASA Review , "Art Gallery of New South Wales", Sydney, Mar 1998, 9 (illus.). Jackie Menzies, Look: 1953-2003 celebrating 50 years , 'Asian Treasures', pg. 57-59, Sydney, May 2003, 58 (colour illus.). The Asian Collections Art Gallery of New South Wales , China 'Buddhist Art', Sydney, 2003, 92 (colour illus. ), 92 (colour illus., reverse). The Art Gallery of New South Wales Bulletin , 'Exhibitions', pg. 10-17, Sydney, Apr 1995-May 1995, 14 (colour illus.). Early Chinese art from tombs and temples , London, Jun 1993. 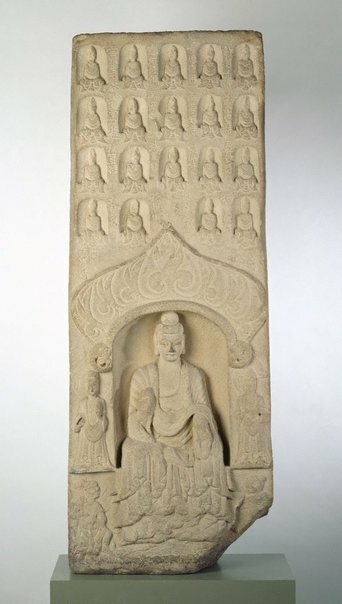 Chinese Buddhist sculpture: A study based on bronze and stone statues other than works from cave temples , Tokyo, colour illus.. pl. 82a, b and 83a.